Things were better back in the day. It doesn't matter which day; that's just how it is. VR is futuristic and realistic, sure, but it's not going to beat 16-bit Star Fox. Whether that's nostalgia or not is beside the point. Greatness is greatness. The good news is that the past doesn't have to be past, and the '90s are alive and well. Nintendo has been releasing throwback versions of its most beloved classic consoles, starting with the NES Classic Edition last year and the SNES Classic Edition this year. The bad news is that Super Nintendos sell out super fast. Luckily for you, however, ThinkGeek has a limited supply of Nintendos that they're releasing early, and you might be able to get your hands on one. All you have to do is head over to the company's website and enter your information before December 8 at 11:59pm. You select whether you want an SNES Classic, NES Classic, or either. Then they'll pick winners at random. On December 12, you'll find out if you're one of the lucky few and receive instructions on how to redeem your very own slice of the past. 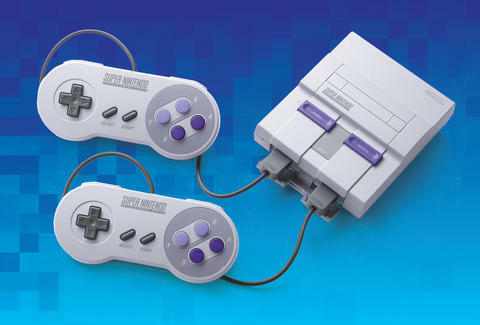 If you are one of the lucky ones, you'll be able to immerse yourself in 21 built-in 16-bit SNES games, including The Legend of Zelda: A Link to the Past, Donkey Kong Country, and Super Mario Kart. On the NES, you'll get 30 games in a total of 8 glorious bits, including Metroid, Castlevania, and PAC-MAN. So enter now and claim your very own time machine. It'll only take you to the '90s, but what a time to be alive. James Chrisman is a News Writer at Thrillist who isn't welcome in the '90s. Send news tips to news@thrillist.com and follow him on Twitter @james_chrisman2.